In the wake of the 2016 election, voters across America disappointed with the November 8th results mobilized to express their desire for progress. From social media pledges and petitions to large-scale movements like the record-breaking Women’s March on Washington, Americans found creative ways to express their opinions on a divisive election. For more than a few citizens, the election mobilized them to push their civic participation to a new level: Running for office. Organizations devoted to supporting “average citizens” interested in running for office saw a spike in interest across the country. She Should Run, an organization and political incubator that offers nonpartisan training for women interested in running for office, saw 4,500 new sign-ups following the election. There are a large number of programs across the country that provide support similar to, and often even further reaching than She Should Run. Many of these programs, such as the Progressive Change Campaign Committee and Wellstone, offer training, advice, and sometimes even staff and campaign contributions to progressive leaders seeking public office, with a special focus on diverse or multiply marginalized demographics. Other programs have more of a demographic niche built in, with specific focuses on women, first- and second-generation Americans, LGBTQIA+, African Americans, and millennials. Most of these groups fail to recognize the disability community in their diversity lists. There is no organization in existence devoted exclusively to helping disabled people run for office. There is a clear need to be filled either through education and inclusion of disability in these programs, or even better, a program designed specifically to helping disabled people seek public office. It is rare to come across recognition of the disabled as a voting bloc with significant and unique political interests. However, a recent Pew Research profile found that the disability community is actually more politically active than nondisabled citizens. Politicians’ discussions on reform to social safety net programs, criminal justice, and health care have a massive impact on disabled Americans. We have unique interests in enacting policies that would, for example, end the subminimum wage or enable more citizens to live in their communities, as opposed to in nursing homes and institutions. However, many Americans and politicians think that disabled people are not capable of engaging in politics, and so disabled citizens are often left out. There are successful disabled politicians already. 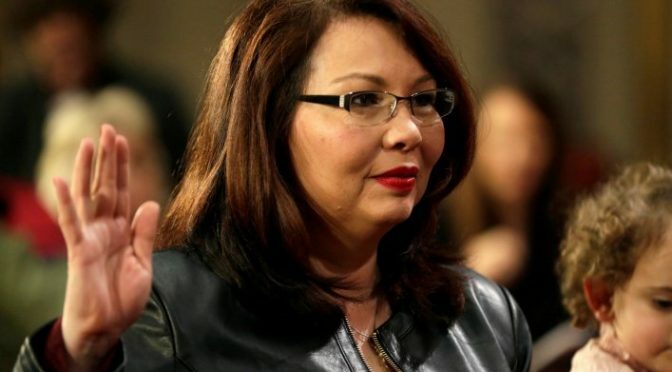 Senator Tammy Duckworth, an Asian-American woman, wounded veteran, and wheelchair user, has been a strong proponent of disability rights and recently brought up the issue of disability rights when asked about President Trump’s nominee for Attorney General, Jeff Sessions. Congressman Jim Langevin, a wheelchair user, is also a large proponent of disability rights in Congress and personally recognizes disability as a complex and significant political issue. A program specifically devoted to helping disabled citizens run for political office could help us navigate barriers that are significant for all people, and especially for the disability community. One of the main obstacles to running for office is financing. Running a campaign, no matter if it’s on the local, state, or Federal level, costs money. The intersection of disability and poverty is significant, with 34 percent of disabled Americans living below the poverty line in 2014. People with disabilities are less likely to have backgrounds or wealthy connections to bolster their popularity, recognition, and ability to run for office. Groups dedicated to providing campaign support to disabled Americans interested in running for office can make their goal financially feasible. Additionally, creating an organization devoted to advancing the political interests of disabled Americans could provide a much-needed boost in recognition of disability issues. Although a number of organizations are dedicated to pursuing the legislative goals of the disability community, and although some movements like #CriptheVote have created a community and gained some recognition for their work, disability policy is still largely closed off. Despite the best efforts of activists, disability rights interests are still not well known by mainstream Americans. By encouraging disabled Americans to be politically active and by getting more disabled Americans into public office, an organization could be another step towards integrating disability rights into mainstream politics. And further, by showing that disabled Americans are interested in active in politics, it could help to break down the notion that the disability community is uninterested or incapable of being interested in politics. There is a clear need to encourage disabled people to run for office. There is a clear need to provide the tools and training to enable our campaigns. By having more disabled people run for office, all Americans can witness the fact that disabled Americans are not helpless and passive citizens, but empowered, active participants in our democracy. All contributors to NOS Magazine are disabled. As editor, I do not feel comfortable telling people how they should speak about themselves, so I generally leave the language contributors choose to use intact. I am proud to be a disabled American. I hope you feel the same way, even if the words you might use are different. Good blog and points…. As a Black, disabled woman who is an advocate, mother…many of us exist in the continuum of needing care, caregiving, and community-building especially women, most especially women of color. That *comprehensive* experience has shaped my perspective and sharpened my advocacy skills which I now use to help inform public policy serving on handful of disability-related boards/councils. I also write as a facet of my advocacy and creative extension. I can also affirm that availing myself to diverse advocacy circles helped expand my self-awareness and augment my skillset and knowledge about disability community, learning it has pride, culture, and political movement. Lastly, “DIS” prefix of “disability/disabled” is not only “not” and “un” but has a Latin and Greek derivative meaning “two” and “duo” hence *another* way of doing and being. Disability/disabled is an identity-marker not an indictment. To have someone with disabilities as president would be a wonderful game change. I’d love to be the first deaf blind president of the United States of America. We have had more than one U.S president who concealed their disability while in office. It would be wonderful to have a president who did not have to conceal their disability. How about helping the disabled to share the same right to life , like the rest of us when we are in the womb . Instead of hearing the 1st questioned ask of a mother when a doctor discovers the child is deformed, disabled, Down syndrome , Do you want to keep IT ? Excellent and important post. I posted it in a few of my disability FB groups. How do I subscribe to your site? In the next couple weeks, we will be setting up a weekly mailing list/digest. Stay tuned! I was a school board member, years ago, before I became disabled by chronic pain. Some days and weeks I could do it or a city council position well again. But other days I would be incapacitated and I suspect that the ablebodied citizens I serve as well as my peers would not weigh what I can do versus what I sometimes cannot (employers need dependable employees, right?) And, my disability status and my disability insurance support could be revoked. If I can do this volunteer position (sometimes, most of the time) then surely I can work again. Many ablebodied people immediately think of deficits in seeing, hearing, or mobility (and it is important to accommodate these) but this is a very limited perspective. This website is neurodiversity-oriented. That means that our writers and readership primarily have disabilities that are neurological, cognitive, and/or psychological in nature. Many of these writers, including the author of this piece, have issues with chronic illness and pain. I want to make it clear that this is not the work of someone who does not understand what it’s like to have the kinds of issues you and I have. Not everyone can do everything, and that’s OK, but I am confident that many disabled people could run for office with adequate support. This also means those of us who have less straightforward-to-accommodate disabilities.